In this relatively new feature for The Source, I express actual opinions while working for government. Members of the media: please take any of these ideas and run with them — we could use the coverage! 1. I think one of the more interesting transportation policy debates these days pits the Washington Post’s influential editorial page versus the Obama Administration. President Obama, as you know, wants to pour billions of dollars into high-speed rail lines around the U.S., including in California. The Post, however, believes high-speed rail won’t garner enough ridership to pay for itself — and thus need massive government subsidies to survive. 1b. The latest Post editorial (see the above link), I think, fails to completely flush out the debate. In my view, the more interesting policy question is this: if there are limited dollars to spend on transportation, is it best spent on transportation within cities (light rail, busways, bike lanes, etc.) or connecting cities? 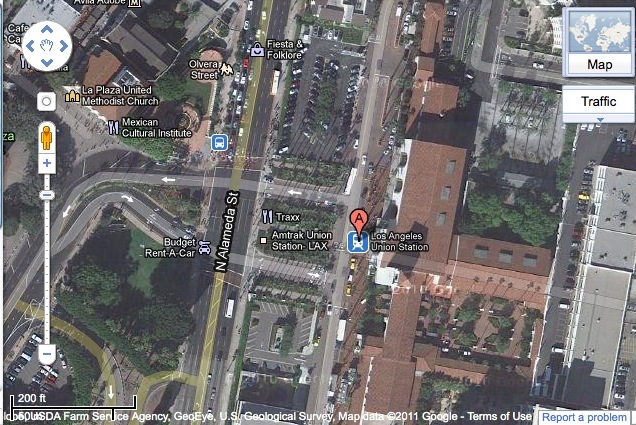 A view of the front of Union Station from Google Maps. Click above to see a larger image. 2. I’m excited about Metro’s intent to purchase Los Angeles Union Station, which I think is a good facility in need of some improvements. I also think it would be great to see some of the land that is part of the station be developed — there should be more density near Southern California’s largest transit hub. 2a. I also think there’s a big need to enhance pedestrian connections between Union Station and the other side of Alameda Street. It feels to me that in its current configuration, the front of Union Station favors cars over people — and I’m particularly not fond of the parking lots in front of Union Station and I wonder if they’re even necessary (see at right). There’s plenty of parking in the four-level garage below the station. 3. I wasn’t surprised that a Superior Court judge dismissed a residents’ lawsuit against the Expo Line Construction Authority. The suit alleged that traffic impacts of an at-grade Expo Line in the area of Cheviot Hills and West L.A. were not adequately studied. Even if the judge had ruled in the plaintiff’s favor, I’m betting that further study would have likely reached the same conclusion — running a train at grade through the area wasn’t going to ruin traffic for the rest of eternity. Just like running trains at grade in many other parts of the world hasn’t ruined traffic for the rest of eternity. (Here’s a link to the judge’s ruling). 4. I think Metro is thus far having a good year on the tech front; first the agency rolled out testing of stored value on TAP cards and then last week testing of Metro’s real-time bus arrival system — called Nextrip — made its debut. Both stored value and real-time info are common in other large cities and it’s great to see them implemented here. As far as I can tell, Nextrip is working great. 5. I thought the recent Jewish Journal cover story headlined “Will Jews get on board?” — as in Westside Subway Extension — was a bit of a head-scratcher. I had no idea religious affiliation impacted transit ridership. And I’m pretty sure when I lived in New York, I saw Jewish people on the subway, including yours truly. On another note, here’s a recent L.A. Times story on a new light rail line being built in Jerusalem, Israel. 5b. The Journal story was basically a debate of sorts, with Beverly Hills Council Member John Mirisch taking the skeptical side. In fact, I think he raises a fair point that lack of parking and/or frequent bus connections could impact ridership when the Westside Extension opens. The good news is that it’s 2011 and there’s plenty of time to ensure there is good north-south bus service, pedestrian and bike connections and drop-off areas so that people can get quickly to and from the subway. I think there is pretty good N-S bus service at each of the proposed stations with the exception of the Rodeo Drive station. But the presumptive cancellation of Route 720 west of downtown LA when the subway extension opens will hopefully allow for those buses to be used to augment service on existing N-S routes such as 204, 207, 217, etc. An important question is: will the municipal operators Big Blue Bus and Culver City have enough funding to provide the necessary robust service to new stations on the Expo Line as well as the subway extension? The 720 will continue running. There are large gaps between some of the stations, and the subway will not run all the way to Santa Monica, so the 720 will still certainly be needed. In fact, it may have even higher ridership, due to the planned bus-only lanes along the route, and the many people who will be taking the 720 to a subway station. I agree that Union Station needs a new, pedestrian friendly approach and the little parking lots need to go. Alameda is such a lousy street for pedestrians and cyclists battling with speeding cars. Not only does the front of Union Station favor cars over people, but the actual layout of the building itself does, too. Case in point: The gorgeous ticket counters just inside the front entrance to Union Station that are unused and closed off now. They were designed at a time when most travelers departing Union Station would arrive at the station by car, so the counters are near the front entrance. But even if they were restored and made usable, it’s a good 500-foot walk in each direction if anyone wanted to use them coming off of public transit. And yet AGAIN, the massive interstate highway system also needs massive government subsidies!! My god, how many times does this point need to be repeated before people stop singling out rail transport out of all the other subsidized infrastructure…? But if the debate is about urban rail vs high speed intercity rail, than that’s a lot more understandable of a debate. Problem is, most people are opposed to HSR for a different reason.